Today’s Job Openings and Labor Turnover Survey (JOLTS) report corroborates last week’s jobs report, which continued to provide evidence that the economy is at best moving at a slow jog, with meager wage growth and employment growth that’s just keeping up with the growth in the working age population. The rate of job openings increased in July, while the hires rate fell and the quits rate remains depressed. 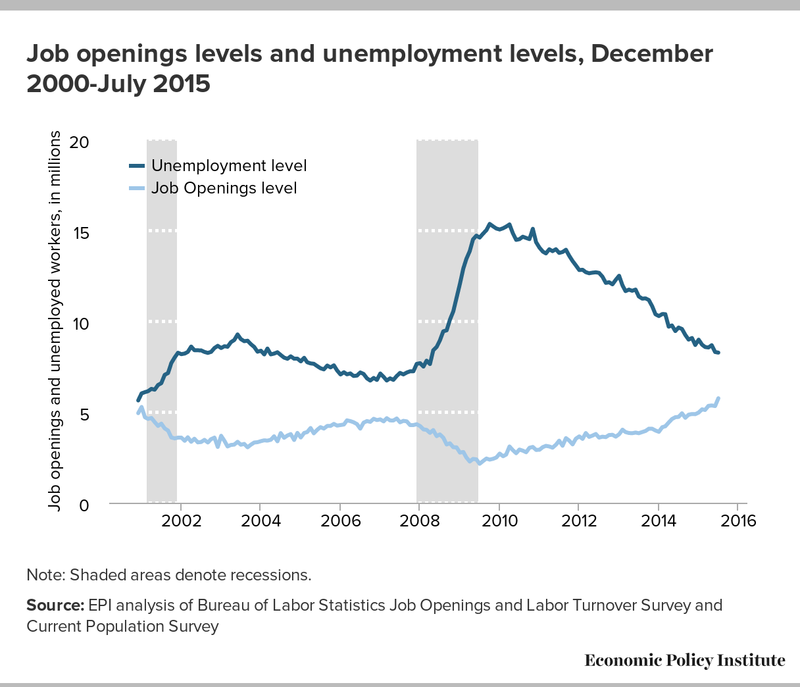 There continues to be a significant gap between the number of people looking for jobs and the number of job openings. The figure below illustrates the overall improvement in the economy over the last five years, as the unemployment level continues to fall and job openings rise. In a tighter economy (like the one shown in the initial year of data), these levels would be much closer together. So it’s clear that there is still a significant amount slack in the economy. Furthermore, on top of the 8+ million unemployed workers warming the bench, there are still more than three million workers sitting in the stands with little hope to even get in the game. 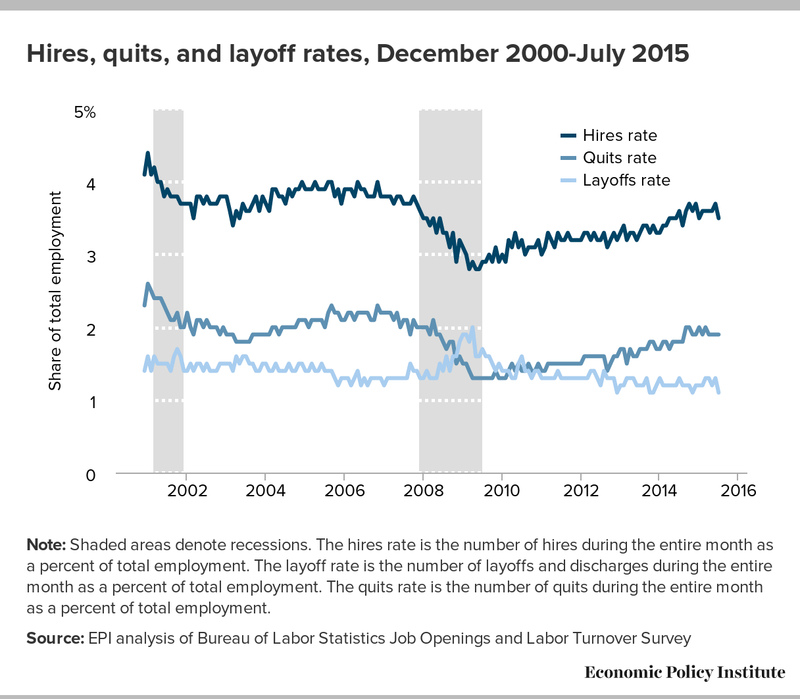 Meanwhile, the figure below shows the hires, quits, and layoff rates through July 2015. The layoff rate shot up during the recession but recovered quickly and has been at pre-recession levels for more than three years. The fact that this trend continued in July is a good sign. That said, not only do layoffs need to come down before we see a full recovery in the labor market, but hiring also needs to pick up–the hires rate dipped slightly in July, and is still below where it was at the end of 2014. The voluntary quits rate held steady at 1.9 percent in July, where it has sat for most of the last six months as workers continue to be stuck in jobs that they would leave if they could. In July, the quits rate was still 9.2 percent lower than it was in 2007, before the recession began. A larger number of people voluntarily quitting their jobs would indicate a strong labor market—one in which workers are able to leave jobs that are not right for them and find new ones. Before long, we should look for a return to pre-recession levels of voluntary quits, which would mean that fewer workers are locked into jobs they would leave if they could. But, as with previous months, we are not there yet. Note: Because the data are not seasonally adjusted, these are 12-month averages, August 2014–July 2015. In fact, while the market does appear to be improving for some types of unemployed workers, there are no significant worker shortages anywhere in the economy. While there has been a clear progress, it is also important to remember that a job opening when the labor market is weak often does not mean the same thing as a job opening when the labor market is strong. There is a wide range of “recruitment intensity” a company can put behind a job opening. If a firm is trying hard to fill an opening, it may increase the compensation package and/or scale back the required qualifications. On the other hand, if it is not trying very hard, it might hike up the required qualifications and/or offer a meager compensation package. Perhaps unsurprisingly, research shows that recruitment intensity is cyclical—it tends to be stronger when the labor market is strong, and weaker when the labor market is weak. This means that when a job opening goes unfilled and the labor market is weak, as it is today, companies may very well be holding out for an overly-qualified candidate at a cheap price. 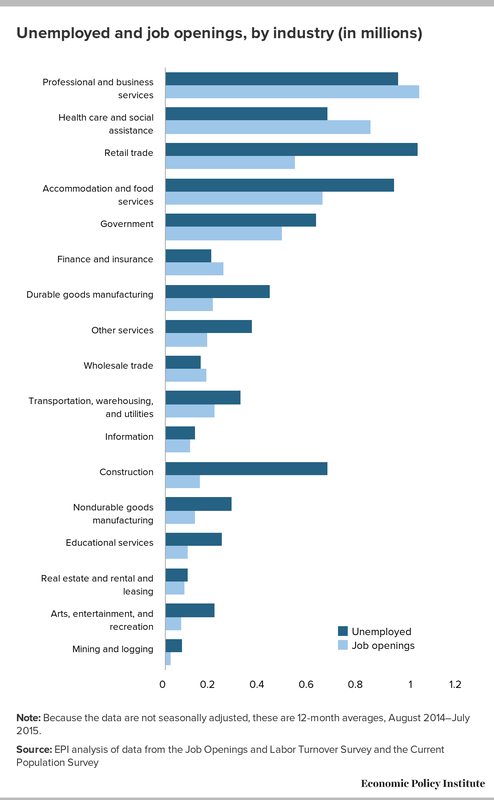 Taken as a whole, these numbers demonstrate that the main problem in the labor market is a broad-based lack of demand for workers—not available workers lacking the skills needed for the sectors with job openings. This morning’s JOLTS report is further evidence that the economy has ways to go before it can be considered healthy. With Congress gridlocked, the most important policy lever we have at our disposal is interest rates controlled by the Federal Reserve. Given the evidence, when the Federal Open Market Committee meets later this month, they should continue to let the economy grow, and not do anything to slow down our recovery.